t*rexes and tiaras: Friday Favourites 286..
For the first time in months, I find myself sitting at my desk and feeling a little chilly. I stopped by the supermarket on my way home last night and found myself lusting over jumpers and coats. It feels as though the change of season is upon us and for once, I think I'm ready for it. Cool, crisp mornings and autumnal weather always has me thinking of ankle boots and layering up chunky jumpers. Here are a few which caught my eye as I was browsing the Spartoo site the other day (one of my favourite sites for shoe bargains). 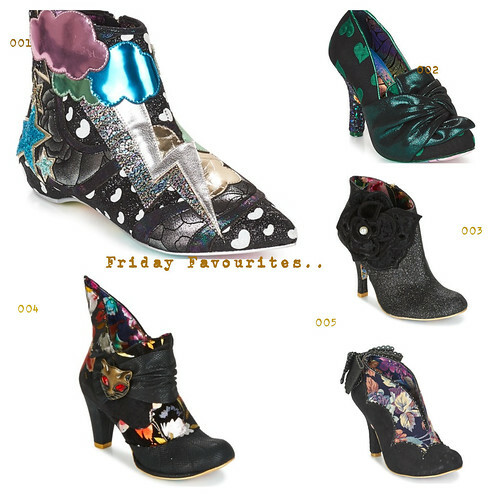 001: These are still topping my list of recent Irregular Choice releases. So much detail. So sparkly. 002: I guess these are more heels than boots, but I love the bow detail and the dark green colours on them. 003: These ankle boots are such a classic style that I think you could wear them for just about any occasion. I love that even though they have a huge floral rosette on the side, they still look pretty staid (by my standards anyway) and would be meeting-friendly. 004: Miaow is a boot which is brought out time and again in new designs, and I love the floral print on this iteration. 005: Another mix of florals and black, with the scallops around the uppers adding interest and also a big bow on the back of these pretty boots. I'm struggling to pick a favourite. How does your style change with the seasons?